They think its all a question of Sport!! They think it’s all a Question of Sport! - Tuesday, 26th April, Grandstand Bar. Based on a mixture of the two popular TV Sports Quiz programmes, the evening will feature two teams. Liam Watson will captain a team of four from the club and they will play a team of four supporters. Liam has selected his team but is not revealing their identity yet but it will contain at least one current squad member. The night will also celebrate the 5th Anniversary of Trust In Yellow and Trust President, Eric Redrobe, together with a few other former players will be in the audience. 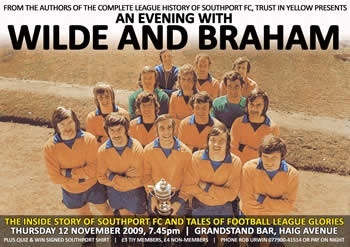 The Trust has booked a table at the 'Championship Dinner' that the club has arranged for Thursday evening, 17th June at 7-30pm at the Southport Theatre. If any other T.I.Y. members would like to join us we can add more people at the table. The evening features a guest speaker in BARRY FRY, the comedian Sean Styles and the star guests are LIAM WATSON and his Championship squad. Trust In Yellow are producing a 48 page programme style championship celebration brochure. It will sell at £3 and be crammed full of comment, pictures, stats and articles from our promotion season. It will be a 500 limited edition and no reprints will be done. There will be a maximum of 4 pages of ads included so it will be great value for money. Full details will be released in the next few days with details of how to order. You can get your name down on the advance order list by e-mailing rob@southportfcstats.co.uk quoting TIY Brochure in the subject heading of your e-mail. Please confirm how many copies you require when e-mailing. TIY are hoping it will be ready by 16th May but a confirmed release date will be announced shortly. August: Matty McGinn Home v Harrogate and Ciaran Kilheeney at Blyth tied.